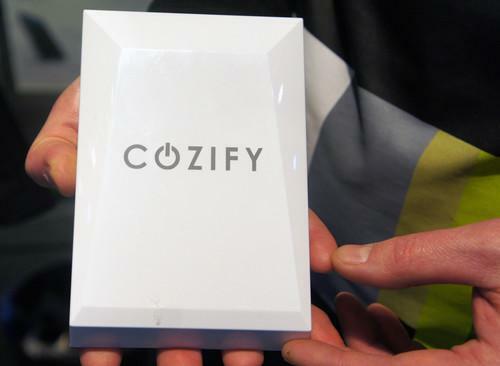 Finnish startup Cozify has developed a home automation hub that supports Zigbee and Z-Wave. Finnish startup, Cozify, hopes its hub will be the center of future smart homes, and has integrated as many radio technologies as possible to make it happen. However, the company isn't taking full advantage of that potential. When you're only seven employees, the development work has to be prioritized. "We have kept the number of features low in order to make sure everything works and the user interface is clearly understandable," said Antti Vihavainen, who is in charge of business development at Cozify. The company's smartphone and tablet apps let users control devices that are connected to the hub. Users can also define so-called scenes, which set in motion a number of pre-defined settings. For example, gradually turning on the lights when it's time to wake up. The hub on its own currently costs €149 (US$160) on the company's online shop, and will ship in March or April in Europe. Chipsets that can handle multiple radio technologies will not only bring down the cost, but also simplify firmware developed, according to Vihavainen. How much cheaper that would make the Cozify hub he doesn't want to speculate. "We are much closer to the customer than any larger entity," Vihavainen said.